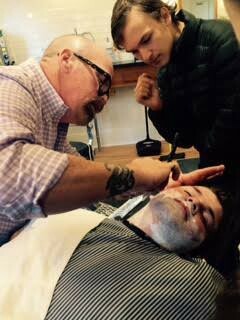 This past Saturday, several members of the cast and crew of “Sweeney Todd” made a trip to Myles Court Barber Shop in Montpelier, VT to learn how to shave with a straight razor. While Sweeney Todd, played by Orlando Grant, does most of the shaving, the director, Erin Galligan-Baldwin, wanted everyone who participates in shaving or gets shaved during the show to be taught the proper way. One of the barbers, Paul, gave an in-depth demo on how it’s done on our very own Riley Flynn, who gets shaved by Kieran Verret in the show. At first glance, while shaving with a straight-razor may seem like a quick process, there are many crucial steps that are taken into account to result in a clean shave. The barber cape must first be placed on the customer, “always with the flourish of barber showmanship,” said Paul. The customer is then reclined in the barber chair — almost parallel to the ground — for the rest of the shave. Then a long towel must be soaked in hot water and heated in a special oven. It is laid on the forearm to test the temperature before applying it to the person’s sensitive face, just below the nose. Particular folds are made so the towel covers the entire face, leaving the nose exposed. It is left on the face for a few minutes to open the pores, and then tonic and oils are applied to moisturize the face and prepare the skin for the razor. Lather is then worked in the hands and applied right before the shaving begins — a step which can also be replaced with soaking the face again in a towel. Next comes the razor. 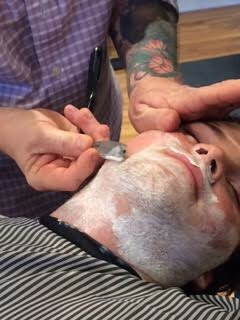 Held in a specific way, the razor must also move in 13 specific areas on the face, starting close to the neck on the right side, working its way to the left side, and finishing with the chin. The razor must make slow, but deliberate movements in each area, going with the grain — moving the razor away from the face on the face, and towards the face on the neck. 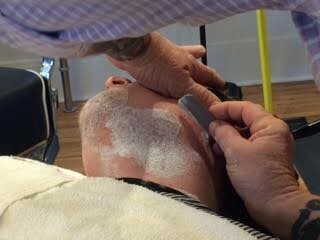 After a first shave, the razor can be passed over again against the grain for a closer shave. Once the razor step is complete, another towel is soaked, heated, and applied to the face, like before. This last towel removes any dead skin or any other debris from the razor, cleaning the pores. Lastly, an aftershave is applied to cool and smooth the skin, preventing irritation. While the entire process can take up to 30–45 minutes, the cast of Sweeney Todd faces the challenge of doing it only to a few bars of music throughout several scenes in the show. Because Sweeney won’t have time to carry out the whole process, he will either do a quick soap-and-water lather, or mimic the towel process, then give his customers a quick shave, before the kill!